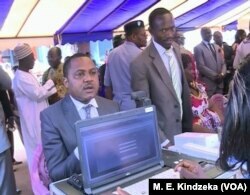 Cameroon elections management body, ELECAM officials encourage the population to register in Bafoussam, Jan. 5 2018. Voter registration is underway in Cameroon ahead of nationwide elections later this year, however the electoral body is encountering both voter apathy and challenges due to insecurity in some parts of the country. The staff of Cameroon elections management body ELECAM move from shop to shop at the busy Mfoundi market in Yaounde convincing potential voters to have their names registered on electoral lists. A man registers for the elections in Bafoussam, Cameroon, Jan. 5, 2018.
Business lady Winifred Bwei, 34, decides not to sign up. "Last election year , I went to vote," she explained. "I saw that somebody had already voted. I saw my name that somebody had already voted [as me] and I was not the one and political parties are complaining that elections are always rigged by the ruling government so I don’t think my voting would change anything." 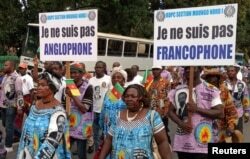 Cameroon plans to hold local council, parliamentary and presidential elections starting in September. If held separately, the polls could continue into October. Few see much suspense as President Paul Biya seeks re-election. He is one of Africa’s longest ruling heads of state. The ruling party has controlled parliament and most local councils for decades. ELECAM officials, who are appointed by the president, have dismissed allegations of rigging as unfounded. Besides the voter apathy, election workers are struggling with insecurity in several parts of the country. Cameroon is currently experiencing tensions in its two English-speaking regions where separatists have declared independence for a new state they call Ambazonia. The yearlong crisis has led to bouts of violent unrest. Voter registration has been suspended in some places like Manyu Division in southwestern Cameroon where there have been regular clashes between the military and armed separatists. Meanwhile, the central African state also continues to battle Boko Haram in its Far North region. The suicide bombings that re-intensified in mid-2017 have abated, but many people are yet to return home. As of November 30, the U.N. Refugee Agency reports a total of 240,000 internally displaced people in Cameroon, nearly all of them in the Far North. Paulin Djorwe, official of the opposition political party the Movement for the Defense of the Republic, says the Boko Haram conflict has left people unable to register to vote. He says many potential voters are unable to acquire national identity cards because police identification stations in some border zones were closed due to Boko Haram terrorism. He says if the elections management body ELECAM and the government want many more people of voting age to register, they should reopen the identification offices. ELECAM says it can only move into conflict zones in the north and some villages and towns in the anglophone regions to begin voter registration once the military declares those areas safe. 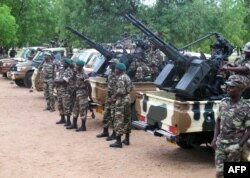 FILE - This photo taken June 17, 2014 shows Cameroonian soldiers standing next to pick up trucks with mounted heavy artillery in Mora, northern Cameroon. The electoral body aims to register 10 million from the estimated 12 million people in the country aged 20 and above and eligible to vote. So far, 6.5 million voters have registered. Abdoulaye Babale, head of ELECAM, says they will intensity their efforts. "We are developing a new strategy," he said. "In rural areas, generally people take their time. We are going to have caravans informing them long in advance and then we implicate the traditional rulers and the civil society to help us because time is against us. In major cities, we also have our caravans and [we will] multiply our stations in order to catch as many voters as possible." No date, or dates, for the polls have been set. Voter registration is scheduled to end the day President Paul Biya makes that announcement. The president can postpone the elections if calm does not return to hotspots.